At the end of the day, Mandy Lupton is speaking on Critical Evaluation of Information: Generic, Situated, Transformative and Expressive Windows at the European Conference on Information Literacy 2015. 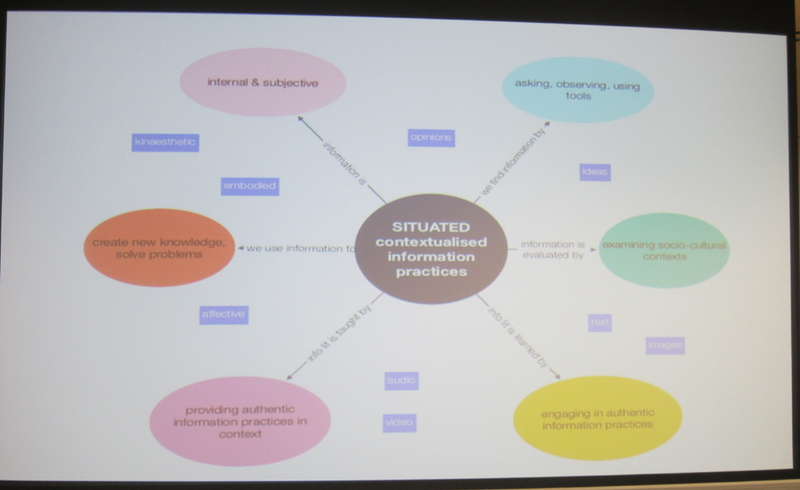 She started by describing her conception of inquiry learning, using a model of three overlapping circles: research cycle, questioning frameworks and the information literacy framework. 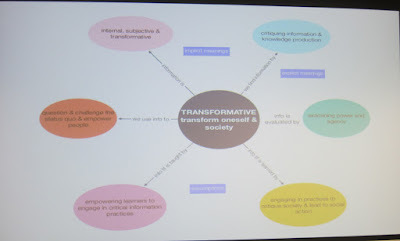 She noted some of the terms that had been used at the conference itself to mean a critical perspective (e.g. evaluation, information discernment). Lupton said she had questioned why there was such an emphasis on evaluating web based information, rather than encouraging critical engagement with all types of information (she used examples of an article in a refereed journal being retracted, predatory publishers and example of a study showing that experimental results were not replicable). She also identified that for younger people all online things are the web (not just things other than journals and databases). Thus there could be a credibility crisis: with propoganda, hoaxes and scams. At that point Lupton identified that for her information included sensory, embodied, subjective, artefactual etc. information, as well as textual. She recalled some of her doctoral work, where she had created four frames: Generic, Situated (e.g. 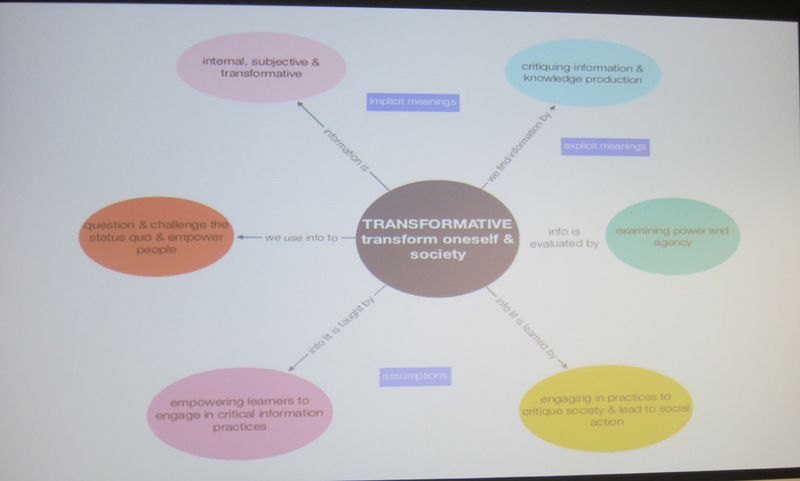 disciplinary approaches), Transformative (coming from critical media literacy) and Expressive (creative) windows on information literacy worlds. These are hierarchical, where Generic is incorporated in Situated, and those are incorporated in both the other two. Lupton showed the generic skills and processes window, and talked about it as a tool for analysis (she runs a module on inquiry learning). She thought it this generic window was important, but as a building block rather than as a whole generic solution. Lupton highlighted some of the questioning frameworks she'd collected, which could be useful, however it was not satisfactory if you used some of these rubrics without looking at the socio-cultural context (she used the example of an article about drop bears). Therefore the next window (Situated) came in. There is a rather poor photo of it, at the top of the post. The Verification handbook http://verificationhandbook.com/ was given as an example of tools for this window, and also https://veri.ly/ Lupton presented a list of questions that represented a verification tool for historical documents, and another example of disciplinary situatedness concerned geographical place. Finally there is the expressive window, in which affect is important (Lupton included the question "does this nourish me") and also aesthetics, self-expression (developing your own voice), and social media responsibility. She showed a rubric used by a design colleague which includes both transformative and expressive elements. This was a fascinating and useful talk: you can find more on her blog and publications.